‘Finally an artform where you can fly, just like in your dreams.’ – Laurie Anderson. Do oceans have walls? I’m flying, on ‘slow fly’. If this is slow, how fast might ‘fast’ be? I haven’t come across an ocean yet, but I’ve passed through endless rooms, which turn into skyscraper size edifices, and then what seem to be the inside of rock formations. All is monochrome. Like a dream. Do you dream in colour? I don’t think I do. Everything here is chalk on blackboard. The world around me dissolves with the wave of my magic wand, to reform in a different combination of lines and angles and seemingly bottomless pits and limitless ceilings. It’s chalk. It turns to dust. It can be wiped out. You can use the wand to write with it. There is a lot already written on the walls. I catch random words or phrases. Empire. Endless. Angels of Artifice. ’There must be a pony ride somewhere around here’ speaks to me. Something about the contrast between the high-tech virtual ride I’m experiencing and the lure of the no-tech pony ride promised. There are figurative images drawn on the walls – giant heads, chairs, dogs. Some are static, some form themselves into line-drawn animations that recall early Felix the Cat or Mickey Mouse cartoons. A row of chalk people dance in endless formation around the walls of a room. Laurie Anderson’s soothing, soporific voice guides, muses, elucidates, or contradicts. ‘I’ll find you by your song’ she says as I race through a low tunnel, walls closing in. Familiar Anderson tropes and themes: Dogs. Death. Remembrance. The endlessness of space, inner and outer. The seductive power of words, written or spoken. Inside the Chalkroom, in the moment, everything is lucid. After I leave, the dream dissipates. I find it hard to recall what I’ve seen and heard; the visceral, kinetic experience of flying is what stays, wiping out the details like a duster passing over a blackboard. As I whizz around, I remind myself that it’s 2-D. It’s not real, it’s virtual. But it feels real and I flinch as I pass through walls and wince with a horrible lurch of vertigo if I look down as the floor drops away. I find a technique for grounding myself. I stamp my foot on the real floor beneath me. Even though I’m looking down through empty space I can feel my foot on the ground. You’re only a pack of cards, I want to cry. But like Alice, the dream world I’ve been dropped into feels real enough to rise up and hurt me. And if the feeling of danger is real, then – is this real fear or virtual fear? This is my second visit. Our second visit. In here somewhere, invisible to me, in her own virtual world, is Aislinn. First time round, my session finished just seconds before hers did, and I took off my VR set to see her standing, her arms raised in somnambulist Superhero pose, swaying gently from side to side as she flew who knows where. In Dreams You Too Can Fly. Once is not enough. We’ve come back for more. Far from feeling more at ease, more adventurous, I’m actually more cautious on the return visit. First time round, I’d passed through the walls before I’d realised what was happening, or been taken by surprise by the steep drops or soaring heights. This time, I know what’s coming. Except I don’t, because every journey is different. 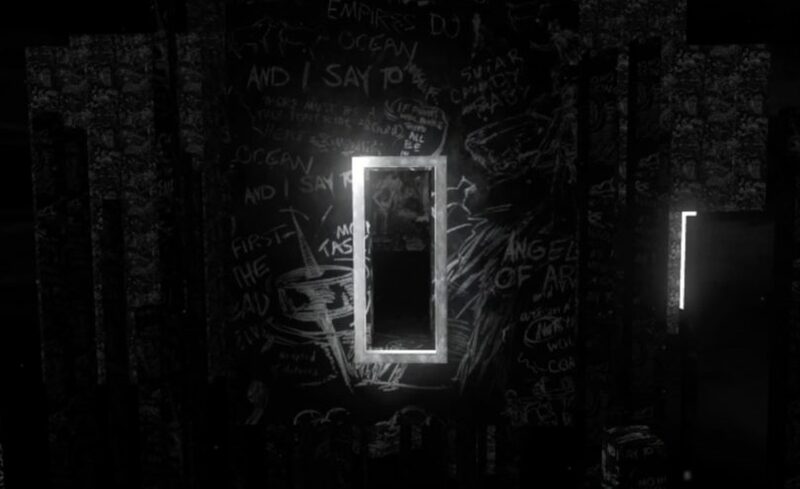 Chalkroom is like a complex video game, programmed to offer endless variables. This time round, I’ve been seduced by the promise of a ‘secret room’ somewhere in there, and find myself passing through ever smaller windows and doors, entering into ever smaller and tighter spaces. It feels claustrophobic. I get stuck. No really, I’m cornered and can’t get myself out of the tight spot I’m in. Somewhere a long way away, there’s a voice saying something, and I realise that someone has been tapping me on the shoulder for a while – it is an usher who is helping me get flying again. I find out afterwards that I’d moved too close to a real wall and had thus blocked the signal to my controller. I find many things I didn’t encounter on my first flight. Most worryingly, an enormous cube of white mist that it is impossible to pass through. But some things I want to find and can’t. Like someone attempting to re-enter a dream from the previous night, I desperately try to find the expansive outdoor space that I remember, a landscape of grey clouds and seas. Suddenly, just seconds before my flight ends, there it is… I breathe a sigh of relief. And then it’s over. I want to run into things. The first time I am in the Chalkroom: fear of crashing, a certain terror at how close I feel pain might be. Second time: relish in flying at things, excitement in recklessness. I get used to the invulnerability of my VR (dis)embodiment even as my perceptions tell me to duck, to cringe, to cry out in pain. Before the attendant tightens the VR helmet, I am instructed to hold my arms out in front of me, parallel, to fly; but instinct tells me to swim through the air, convinces me that I must propel myself forward by sweeping my arms in half-circles around my body, making midair chalk-dust angels. Many false starts follow as I clunk into walls and cut my flight short with pinwheeling arms. I can call a menu into existence and warp to a specific room, but this feels like cheating. It is more wonderful to stumble across new sights. My wonder is especially potent when I find a tree. It grows out of a mirrored floor and is reflected – doubled. Bubbling, floating strings of letters surround it; or perhaps they are falling leaves, strips of an unreadable narrative cut from some unknown book. I sweep my hands through the letters but cannot catch them. This body is limited: it is sometimes too immaterial, other times too solid. This body cannot dive beneath the reflective floor and see up close –come close enough to desire to touch – the second tree and look up at the ‘real’ tree. 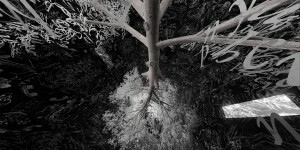 Or perhaps I am trapped in the mirror-reality and the ‘real’ tree is the inaccessible but visible one below me. Some sights disturb and frighten me, such as the chain of small chairs that meanders and writhes in midair. Other sights are less primally distressing. I long to interact with the piles of chairs scattered along the walls and in the corners of another room. I want to run through them as if they were autumn leaves and listen to the satisfying clatter. But my legs cannot carry me to them. I cannot touch the objects of this world. Instead I stumble into the real stool I have forgotten about. Its clatter disappoints. Halfway through my second trip I reject the rooms and zoom out to view the marvellous horizon that greeted me when I first dropped into the dream. In the beginning, Anderson’s voice was an unbreakable traction pulling me over dark floating pillars and through the illuminated doorway. But my eyes were drawn to the horizon behind me. I longed to fly and swim and run away to the silvery shoreline even as my eyes stung from the intensity of the colourless sunset. I twisted around because I preferred to see this photo-negative beach than pay attention to the alphabet cloud overtaking me as Anderson inducted me into the Chalkroom. When I return to the pillars, the shine and sparkle of the virtual sea is as beguiling as I remember. The sunset reflected on water is like the pure light and clarity of mind in the Bardo that engulfs the disembodied spirit as it passes through the after-death state into reincarnation. This liminal space between embodiments, as described in the Tibetan Book of the Dead, is a test during which the spirit witnesses deities enacting a terrific theatre; to self-liberate, the spirit must recognise the deities as its own projections. The Bardo is where the spirit can reject illusory fear and self-attachment and find the path to less suffering. Fittingly, my experience in the Chalkroom has been shaped by odd desires and fears I must abandon to escape back into life. Bardo is whispered in my ear in the dog room, where an illusory animal – a cloud of letters, a projected demon – swallows me up as I fly through its mouth and into the perfect darkness behind it. 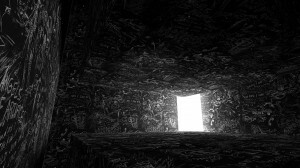 I re-materialise near the main entrance after a moment’s travel into the void. There is no secret room beyond. The dog, and the expectation of such a room, was only the deceptive radiance of my mind. I return to one room again and again. Here I can pull the chalk dust from the walls, manipulate the ephemeral matter so it coalesces into letters, words. Like the clouds and strings of text elsewhere in this world, once liberated from the wall the dust becomes typescript, letters lifted from a computer screen, a printed book. The letters are mechanically born, unlike the handwriting scrawled over miles of chalkboard. I press the trigger on my righthand remote to active my limited control over this dust: I can call it to me, but other than activating the virtual gravity in my hands, I cannot change its galaxy shape or re-scramble the letters into words other than ‘Bardo’ and ‘Dream’. I discover on my second visit that I can also pull the lefthand trigger and split the chalk dust into two spirals. I enjoy lazily waving these swirls around me – bringing them close enough I can almost feel their gentle touch on my cheeks, across my shoulders, over the backs of my hands. I spin, sometimes smacking a hand against the real walls of the box I am in, sometimes nudging against the stool, sometimes tangling my neck in the umbilical wire of the VR helmet, my tether to the material world and the mechanism of my cyborg reincarnation. Chalkroom is a virtual reality work by Laurie Anderson and Hsin-Chien Huang; a 15-minute solo experience in which the reader flies through an enormous structure made of words, drawings and stories. It has been previously presented in the USA, Denmark, Italy and Taiwan.